All the virtues co-operate with the intellect to produce this intense longing for God, pure prayer above all. For by soaring towards God through this prayer the intellect rises above the realm of created beings. When the intellect is ravished through love by divine knowledge and stands outside the realm of created beings, it becomes aware of God’s infinity. ‘How abject I am, for I am pierced to the heart; because I am a man of unclean lips, and I dwell among a people of unclean lips; and my eyes have seen the King, the Lord of hosts’ (Isa. 6:5). The person who loves God cannot help loving every man as himself, even though he is grieved by the passions of those who are not yet purified. But when they amend their lives, his delight is in­describable and knows no bounds. A soul filled with thoughts of sensual desire and hatred is unpurified. If we detect any trace of hatred in our hearts against any man whatsoever for committing any fault, we are utterly estranged from love for God, since love for God absolutely precludes us from hating any man. He who loves Me, says the Lord, will keep My commandments (cf. John 14: 15, 23); and ‘this is My commandment, that you love one another’ (John 15:12). Thus he who does not love his neighbour fails to keep the commandment, and so cannot love the Lord. Blessed is he who can love all men equally. Blessed is he who is not attached to anything transitory or corruptible. Blessed is the intellect that transcends all sensible objects and ceaselessly delights in divine beauty. If you make provision for the desires of the flesh (cf. Rom. 13:14) and bear a grudge against your neighbour on account of something transitory, you worship the creature instead of the Creator. […] God, who is by nature good and dispassionate, loves all men equally as His handiwork. But He glorifies the virtuous man because in his will he is united to God. At the same time, in His goodness He is merciful to the sinner and by chastising him in this life brings him back to the path of virtue. Similarly, a man of good and dispassionate judgment also loves all men equally. He loves the virtuous man because of his nature and the probity of his intention; and he loves the sinner, too, because of his nature and because in his compassion he pities him for foolishly stumbling in darkness. Maximus the Confessor (580-662): Four Hundred Texts on Love 11-20, 25, Text from G.E.H. Palmer, Philip Sherrard, and Kallistos Ware (trans. and eds.) The Philokalia: The Complete Text, vol. 2 (Faber & Faber, London & Boston: 1979), pp.54-55. **The translators of the Philokalia say the following about the word “intellect” as used in this passage from Maximus and by other Greek authors: INTELLECT (nous): the highest faculty in man, through which – provided it is purified – he knows God or the inner essences or principles of created things by means of direct apprehension or spiritual perception. Unlike the dianoia or reason, from which it must be carefully distinguished, the intellect does not function by formulating abstract concepts and then arguing on this basis to a conclusion reached through deductive reasoning, but it understands divine truth by means of immediate experience, intuition or ‘simple cognition’ (the term used by St Isaac the Syrian). 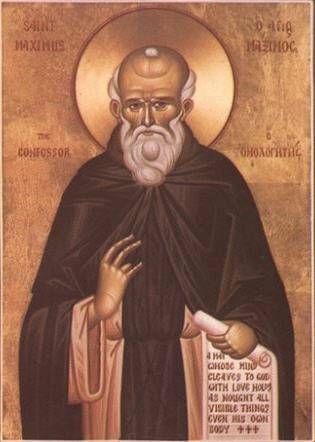 The intellect dwells in the ‘depths of the soul’; it constitutes the innermost aspect of the heart (St Diadochos). The intellect is the organ of contemplation, the ‘eye of the heart’ (Macarian Homilies).